Cristo Rey High School’s volunteer student writers produced newsletters and launched IHHELPP’s blog..
Students’ reflection on volunteering for IHHELPP. We are students. We don’t have masks or capes. What we have is a school uniform. We don’t have laser eyes, but we can open eyes and minds. We don’t have super speed, but if anybody needs help, we’ll be there. We can’t fly, but we dream and aim high. We don’t have superpowers or swords. What we have are pens and the courage to write and take a stand. We are grade 11 students of Cristo Rey High School, Capas, Tarlac, Philippines. We volunteer our time and talents to write blog articles and design websites for IHHELPP. To be an IHHELPP volunteer is a big responsibility. It is also an opportunity to get out of our comfort zone and work. Imagine what ordinary students can do to help people in need? Well, we can write. We can speak. We can stand for what is good. Writing for IHHELPP gave us the opportunity to do so. It also gave us experience and molded us into people concerned with our community and country. . .
We began with the blog. Our team collaborated and came up with some articles to kick start the blog. Two of our members studied website designing and managed the blog page. We were all new to blogging or web designing. We worked from scratch and had tons of drafts. We are not experts, but we are trying our best. We believe that the ability to help other people through writing is a triumph, especially for us students. Yes, we are just students, but we can make a difference. We don’t need superpowers to help others. We don’t have to be young or old, or rich or poor to bless other people’s lives. All of us have the ability to share a part of ourselves to others. Wiser than Iron Man. Faster than Flash. Tougher than Superman. Who comes to your mind when you hear the word “superhero”? We know someone who is even better. He does not fly nor does he shoot laser beams from his eyes. However, he’s not short of being called “super”. Samuel Dela Cruz Mecham from San Clemente, Tarlac, Philippines fits this description. Tatay Sam, as his close friends call him, is a hard working father and provider of two daughters who recently graduated from college with Marketing and Psychology degrees. Tatay Sam supported his daughters throughout college through farming and perseverance. Tatay Sam from San Clemente, Tarlac, Philippines exemplifies that hard work and diligence lead to success. Upon receiving training on CEB production, Samuel worked with IHHELPP in the CEB (Compressed Earth Blocks) presses in Camiling and was part of the blocks production for the San Fabian eye clinic project. “Learning how to create CEBs helped me support my family financially,” says Tatay Sam. “Personally, I am just grateful to learn a new skill. IHHELPP gave me an opportunity to improve myself as a person and a provider.” Tatay Sam is one of many Filipinos benefitted by IHHELPP’s CEB livelihood program. For IHHELPP, life is like making CEBs; you need to exert effort, patience, and passion to make the perfect brick or the dream you always desired. 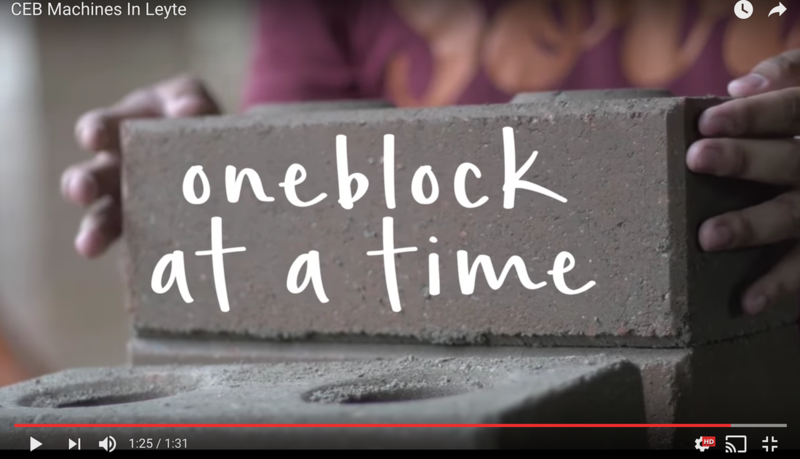 This video is a follow-up on IHHELPP's purchase of four compressed earth block (CSEB) presses for its livelihood and affordable housing efforts in the Philippines. These presses create CEBs, earthen blocks comparable in strength to that of regular bricks but created with less expensive and more accessible ingredients. Check the video out and share with friends. Click here to watch video. Imagine an evening of Filipino folk dances, talents, arts and crafts; a night of generosity, charity, and kindness. Welcome to IHHELPP’s Annual Gala of Gratitude and Giving! In 2015, IHHELPP started a tradition of “Gratitude and Giving” with an annual gala. The Gala is meant to increase community awareness of IHHELPP’s vision and mission as well as raise funds for IHHELPP’s projects in the Philippines. With the upcoming Gala this November, let’s revisit last year’s event. Attendees summed up last year’s Gala of Gratitude and Giving as “eye-opening and inspiring.” During the Gala, IHHELPP showcased its latest projects and accomplishments as a non-profit from its humble beginnings in March 2013. Highlights included the building of the 1st disaster-resilient home for a family in Carigara, Leyte, the Fish-pond harvest, the CEB press project, and many more. Entertainment was provided by local talents such as former Miss Asia-Utah Thelma Long and singer-song writer Emily Hammond. Local community members donated items for the basket auction, and there were Filipino-made crafts and articles for display and sale. The Gala raised community awareness of its mission and started raising funds for IHHELPP’s educational project to build a technical school in the Philippines. These perhaps drove the Gala’s main success. Help us assist Filipinos to have better opportunities in health, education, housing, and livelihood. What are you waiting for? Come join us for the 2016 IHHELPP Gala of Gratitude and Giving this 19th of November, 2016 at Northampton House, 198 W 300 N, American Fork, UT 84003.